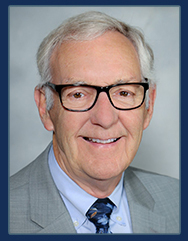 Because of my long-running interest in helping engineers and other professionals work smarter and be more creative and innovative, I continue to study, write, teach, and speak about what neuroscientists have recently learned (last few decades) about our brains and the practical application of that knowledge in our work and beyond. Here I offer an example of how you can use brain basics to replace your “bad” habits with “good” habits and, as result, improve your effectiveness and help others do the same. Habits - What Are They? You may be thinking: That’s fine for routine activities, but certainly not when dealing with serious matters! When designing, drafting proposals, preparing to teach classes, and making important decisions, I am always concentrated and focused. Research says no! Much of what you do, including your professional work, is heavily-driven by habits. Clearly, habits can be “good” and “bad”— both kinds sneak up and capture us. Investigative reporter and author Charles Duhigg explains that habits are “the choices that all of us deliberately make at some point, and then stop thinking about but continue doing, often every day.” In other words, when you contemplate any of your habits—good and bad—you realize you learned them, which means you can unlearn them or, better yet, replace them. Let’s explore what neuroscience can teach us about this promising unlearning/replacing idea. When we are in the habit mode, our subconscious mind—not our conscious mind—directs our behavior using the cue-routine-result process. We subconsciously see or experience a cue, such as feeling thirsty in mid-afternoon; we initiate a routine, such as buying a soft drink; and we receive a result, such as feeling good. Another example of the habit process might be we meet a potential client (cue), we start talking about our self (routine), and experience a frustrating indifference (result). The cue-routine-result process, which is essentially controlled by the subconscious mind, is the key to understanding habits and their results. If we are not pleased with some of the results, such as consuming too much sugar or failing at marketing, that three–step process enables us to change the habits, as we’ll now see. Consider a method that you might use for unlearning what you consider a “bad” habit and replacing it with a desired “good” habit. The method is based on the cue-routine-result process, in which new habits are developed through many repetitive cue-routine-result cycles. Let’s revisit the previously-mentioned unproductive meet-a-potential-client scenario with this in mind. This scenario is not working for you—it’s a bad habit. Starting today, when you experience the cue of meeting a potential client, try to remember to enter a new routine, that is, asking him or her questions. Then try to note and remember the result. That one-time change will not be easy and you are very far from replacing your bad habit with a new habit. You must persist. The next time you experience the cue, you must faithfully repeat the new routine, or refine it, and follow through. No, I don’t know how many cycles you will need, but many. My rule of thumb is 30 days of successful repetitions. Eventually, your subconscious mind learns the new habit. The pay-off is that you automatically, habitually, productively go into a question asking mode when meeting a potential client. Stress declines and marketing performance improves. Perhaps you like this good-habit idea as in using my brain to habitually practice productive behaviors—being on smart automatic pilot—appeals to me. However, learning a habit by this tedious cyclical process seems burdensome. That reminds me of how I learned how to use a keyboard, play the trombone, or drive a car. Therefore, I’m going to circumvent the cycle and simply think myself or talk myself from some bad habits into some good habits. Sorry, won’t work. Your subconscious mind is illiterate—you can’t talk to it. As stated by Neal Martin, author of the book Habit, “The habitual mind is nonverbal, so it doesn’t learn by reading or listening to an explanation. 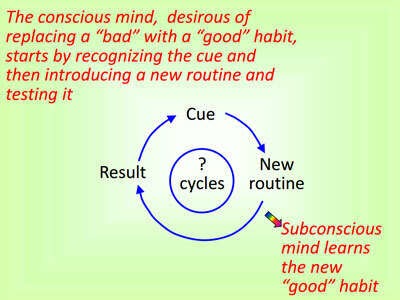 It learns unconsciously through associating an action with an outcome.” In other words, habits are learned via the tedious cue-routine-result cycle. If the possibility of habit creation or change interests you, then consider the long-term potential for you as a leader and mentor, that is, one who positively influences others. Philosopher and psychologist William James explains the potential this way: “Small, seldom-seen habits have the power to bear us irresistibly toward our destiny.” Because of what you now know about one aspect of the workings of your brain, you have the ability to form positive “small, seldom-seen habits” that profoundly affect your life and those of others. You can assist receptive individuals in changing their habits. This article is illustrates brain basics at work for you—and that application of basics is just the tip of the applied neuroscience iceberg. This article draws on research used to write my 2017 book Introduction to Creativity and Innovation for Engineers. I welcome opportunities to speak, teach, conduct workshops, and collaborate about any aspect of helping engineers work smarter -- more productive and creative/innovative. Contact me at stuwalesh@comcast.net or 219-242-1704.